Have you ever had a day where everything that could have gone wrong did? That every situation you found yourself in just got a little more complicated and you simply felt defeated? After the world's longest day in the office, I was stressed and desperate for an escape. I left my office in such a whirlwind, that it was only until I got a few miles from home that I realized I left my person locked in my office... downtown.. a 45 minute commute away. This is where I lost it. On any normal day I would've considered it no big deal and moved right along. Yesterday was not normal. As soon as I exited the highway my gas light went on. I had also planned to pick-up some kind of healthy dinner due to my fridge being pretty desolate. The problem? I left all my money at work. Awesome. "What can I do to help make this better?" Luckily enough, he was having guys night about a half mile from my Weight Watchers meeting, so I drove over to get some help. He promptly met me in the parking lot with a sweet smile and sympathetic brown eyes. Without a moment of hesitation he told me to take his credit card, fill up my car and get something for my grumbly tummy. Well naturally... I started bawling. Mascara went everywhere, sniffles, the whole nine yards. The poor boy didn't know what kind of raw emotions and overly dramatic stories were coming his way. But do you know what? He didn't try to offer advice or suggestions, he just held me and let me cry it all out. I'm pretty sure his GAP hoodie is covered in mascara residue today, but I sure love that man. He is my sunshine and he consistently inspires me to be a better, kinder, more selfless person every single day. I am so thankful that he's my buddy. Who is your sunshine today? Have you thanked them for making you smile? Thanks for being you, buddy. Love you. After a week of being ridiculously ill, not working out, and eating whatever is convenient, processed and easy (gross)... I have my groove back! I was a little concerned after BF and I spent time with our families out of town, the eating out and homecooked meals would catch up with me. I was very pleased to see weight loss after the last few weeks of nothing. I've got my workout back on and it honestly feels so good... I've missed feeling this way! After several weeks of hanging in there, I am glad that I am still sticking with it. I am right on track to go where I want to go, so I am celebrating a loss today! In order to make my weight loss goals more achievable, I have decided to break it down into a few mini goals so that I don't feel discouraged by being 20 lbs away. So only 5.6 lbs to my next goal - all I have to do is keep on keeping on! I also want to thank all of you who have sent messages, e-mails or left comments - you are so encouraging and sweet, and that means the world to me! Time to crush this next goal! I'm so sorry we had to skip Mingle Monday last week due to my ridiculous week-long illness! 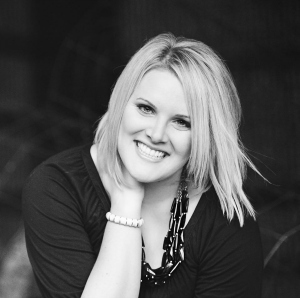 I'm sure you're all just dying to get your name out there and blog hop... am I right? Well, so far I am having an absolutely stellar morning. I've met with the CEO and cancer liason physicians of a major healthcare system and my presentation went better than I could have ever hoped for. On cloud nine for sure! Will you pretty please do me a favor? Will you pay it forward by using the button below in one of your posts today? I can't possibly thank you enough for helping me spread the word - you're too sweet! 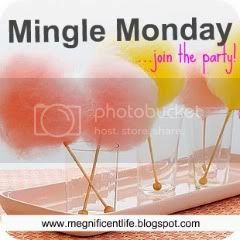 3) Go visit 2 other blogs saying hello from Mingle Monday! Wishing you a beautiful start to your week!! C ould May 6th come any sooner?? Ever since I saw the amazing trailer for "Something Borrowed" I have just been DYING for it to be May! If you don't know what I'm talking about, you're totally out of the movie magic loop. No worries, lovelies, I'll be sure to catch you up STAT! So who has read the amazing Emily Giffin "Something Borrowed" series? I am not sure if I've been under a rock for the last few years, but I finally bought the first book in the series, "Something Borrowed", a few weeks ago and it's uh-mazing! Well lucky us, they've made a moving starring my beloved favorite, Ginnifer Goodwin, as Rachel and they've cast Kate Hudson as the attention-needy Darcy. Thank you for simply being you, the warm-hearted, kind, thoughtful, hilarious, adventurous, manly man that you are. Thanks for sticking it out with me through thick and thin, your unconditional love and support mean the world to me. We have made so many beautiful memories and have gone on some great adventures over the last year and a half... and I'm looking forward to many more to come! I hope you feel very loved and celebrated over this next week/weekend (or heck, let's just celebrate for the next month?! ), because out of all the wonderful people in the world, you sure deserve it. ...and shared with some of the people we love the most. Happy happy 27th birthday, mister! Boy, do I sure love you! Yes, I am alive after battling the flu for the last few days. Semi-unfortunately, it wasn't the gross barfy flu that would have aided my pounds lost on Weekly Weigh-in. That being said, I am super thankful it wasn't afterall, and I am happy to be feeling quite a bit better! So I weighed myself this morning, and I was almost positive it would be more. My clothes are fitting differently and all, but sadly it was not. I am not sure if the lack of weight loss is partially due to the fact that I've been eating a copius amount of sodium-laden soup and crackers for the last 2-3 days, but I am happy it was a loss of some kind. So of course, I am chugging my water today trying to get rid of all the sodium sitting in my system before my Weight Watchers meeting tonight. As soon as I can get myself all the way healthy in the next few days, I will be returning to the gym for more lunch time workouts! Headed to the doc to hopefully stop this yuck. It's BF's bday today, so I want to catch it now while I can - I can't miss celebrating! Raincheck on Mingle Monday, friends... hopefully I'll feel much better by tomorrow! The earthquake and tsunami devastation footage in Japan has been horrific. My heart goes aches for all of the Japanese people who have been affected. Today I feel very honored and humbled to be a part of the For Japan With Love bloggers day of silence to aid disaster relief. The goal is to raise awareness and funds by asking all of you sweet followers to donate to the cause. I have already donated $10 to this cause, and I would love for you to join me. A $10 donation is a sacrifice of one meal eating out or 2 Starbucks frappucinos. It's that easy. We can do this!
. :: Any amount would make a HUGE difference! ::. Completely and utterly stressed out this week. I feel like I can barely keep my head on straight at work, which is exactly why I have a gym membership. It feels so great to get out of the office mid-day and go for a run. Thank God I can take out my pent up frustration on that treadmill or else I might explode! Having a rough week? Need a workout accountability buddy? I absolutely love this Web site so much and it has kept me accountable for working out. On RunKeeper, you have your "street team", which is really just a fancy way to say workout friends. It's a great way to encourage each other and I'd love for you to join me! Looking forward to having new buddies!! Happy St. Patrick's Day, lads and lassies! I hope you've dawned your green for today, or else you may be pretty sore from all the pinching! And BTW, green underoos don't count. Trust me, I've argued it. Green beer, green food, Irish accents and pinching anti-green folks! Totally a legit and amazing holiday! Who has amazing St. Patty's plans? I've been told there is a massive parade close to my office, but unfortunately I have meetings all morning long... boo. That being said, I think there may be a post-work green beer in my not too distant future! BF and I have a little date night planned, consisting of dinner and thrift store shopping for my Trashy Bday Bash party this weekend. BF and two of our good friends have birthdays within a week of each other, so they decided to do a big birthday blow-out... I can't wait! It's a total toss up... I can't choose. Can you tell the boys chose the theme? It's going to be pretty fun! After thrift store shopping tonight, I may talk BF into helping me make some pretty green velvet cupcakes to bring over to our March Madness kick-off game tonight - Go K-state! Life can feel a little overwhelming at times. Any of you in the same boat? Maybe you're stressed from work, worried about circumstances, or are bearing the burden of someone else. My heart was heavy this morning, but I'm choosing to be happy. Have you ever seen a bird with a french fry? + usual 45 minute commute was only 20!! WOO! guess who bought it?! THIS GIRL! + mellow office day - sans meetings/appointments is fab! From the very beginning of this weight loss journey, I promised to post about the high's and the low's. Well, last week was definitely a low. With my brother visiting from out of town, it was a whirlwind of eating out, too many treats and minimal exercise...boo. So, unfortunately there was no weight loss this last week, and I wasn't expecting there to be. A lack of meal planning and not consistently counting my WW points contributed to this week's gain. Nothing makes me more determined than to see my hard work undone by one too many slices of my homemade cake or lack of will power. Yes, it was a less productive weight loss week, but that won't stop me!! Cheers to a better/more focused week! Warning: if you are hungry or hate delicious cake, stop reading ASAP. This cake recipe will completely blow your mind... and your diet. Which is my soul motivator for my lunch date with the eliptical machine today. So my little broski, Kelly, has been in town since Sunday and I've enjoyed every ounce of time spent with him. Well, last night was our usual Monday "family dinner". Like every Monday evening, BF, a handful of our best friends, and I meet at BF's house for an amazing dinner. Each week one person makes the main dish and everyone else brings a side. By far one of the highlights of my week. Well last night BF made his famous AMAZING turkey chili, so Kell and I decided to take on a dessert. After our sibling brainstorm sesh, we went to one of my favorite go to experts... Pioneer Woman! Now, if you haven't visited her amazing site, you are missing out. I have tried so many of her recipes and not one has been less than incredible. Not to mention her step by step food photos are amazing and oh-so-helpful! Anyway, we tried her decadent Strawberry Shortcake Cake last night and it was complete and utter sprintime heaven. Dense layers of strawberry infused moisture-rich shortcake, topped with creamy creamcheese frosting pallooza. Have a special birthday or holiday coming up? Bake this sucker and wait to here to Mmmmm's and Oh la la's! So. stinking. good. IMPORTANT: Be sure to use a cake pan that’s at least 2 inches deep! Before baking, the batter should not fill the pan more than halfway. Pour into greased and floured 8-inch cake pan. Bake at 350 degrees for 45 to 50 minutes, or until no longer jiggly like my bottom. Remove from cake pan as soon as you pull it out of the oven, and place on a cooling rack and allow it to cool completely. Well it is. I know the recipe looks long, but I promise it is super easy, especially with the step by step picture how-to's! This is the perfect springtime cake, and I highly recommend it. I wish I could have shown you the looks on our friends' faces last night... that alone would sell itself. Kelly and I had a blast being creative together - he's such a fun brother! :) I'm planning to file this recipe away to break out on Easter!